Our hearty corn and bacon chowder is so easy to make, it's the perfect soup on a chilly day! 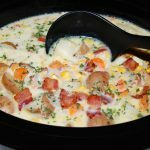 Place potatoes, carrots, onion, corn, cream corn, chicken broth, half of the bacon, thyme, parsley, garlic powder, salt and pepper into the slow cooker; stir to combine. Cook on HIGH for 4-5 hours or on LOW for 7-8 hours until vegetables are tender. Whisk together cornstarch and evaporated milk. Stir milk mixture and butter into the slow cooker 30 minutes before serving. Just before serving, season with salt and pepper to taste. Ladle chowder into bowls and garnish with more parsley and reserved bacon.